Summer is now happening at Walt Disney World in Orlando Florida. I am from Florida and I would much rather be hot than cold, but even I have to prepare myself for some of the Summer days in Florida. Crowds in June at Disney World trend to medium and heavy. They are not as strong as they use to be years ago as people are starting to avoid the Summer at Disney World in favor for Fall. With kids out of school for the Summer your crowds are definitely higher than what we see in the earlier months, but you are still avoid peak season crowd levels which is nice. June, July, August and even parts of September can mean hot weather in Orlando Florida. Drink lots of water, plan your days with breaks and indoor air-conditioned attractions. Use Disney’s Fastpass system to beat the lines and beat standing in the heat. Also get ready for summer 3 PM thunderstorms and pack an extra pair of dry shoes in your luggage. Summer at Disney World is all about having a plan and being prepared. June does not have any extra special events happening in the Disney parks. But I suggest you make your own even and enjoy your Disney World Resort at least one day at the pool. Our kids love the Disney pools and I even have a hard time getting them to go to the parks. So plan a day, or more for relaxing at the pool at your Disney World resort. You could split up a day and do Disney Extra Magic Hours in the morning, leave the park in the middle of the day to get out of the heat and crowds and go to your resort pool. Then when it cools off at night catch a nighttime show at Epcot or Disney Hollywood Studios. 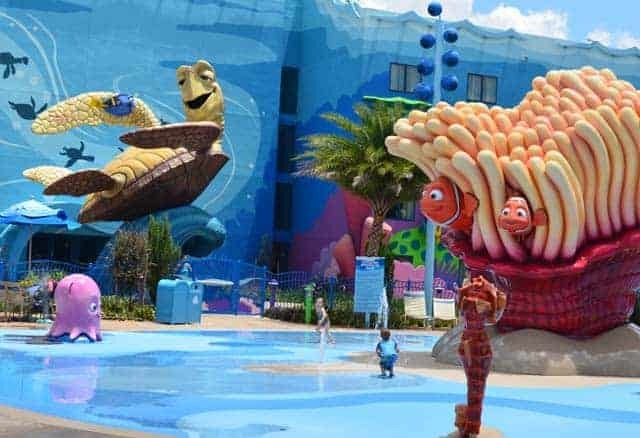 Bonus: If you are staying at an Epcot location resort you can walk or take a boat very easily to Epcot or Disney Hollywood Studios and back to your resort. I like to have a nice dinner, see the fireworks at Epcot and then 10 minutes later be relaxing in my room at Disney’s Beach Club Resort. 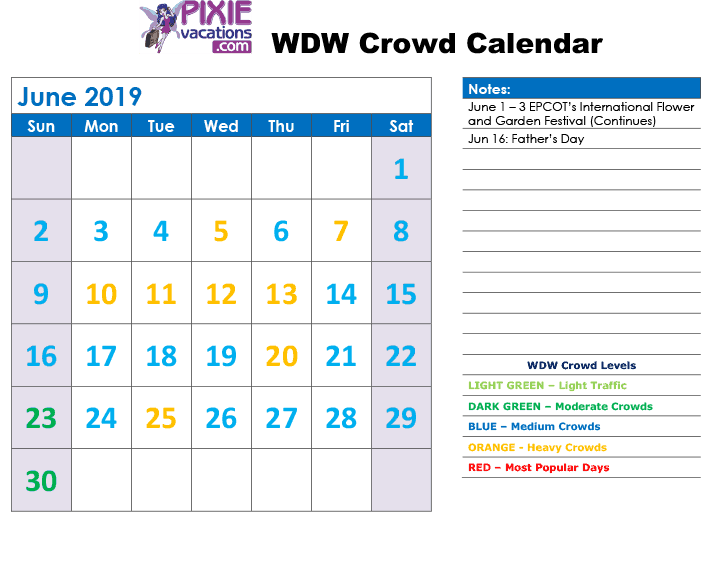 I am happy you are here and using our WDW Crowd Calendar, but I want to share other Crowd Calendar resources with you. My favorite non-free Disney Crowd Calendar is at Touring Plans. Touring Plans also has a tool that lets you create “Touring Plans” The Touring Plans service is pretty affordable, and you can also search the webs for a Touring Plans Coupon Code to save a few dollars.